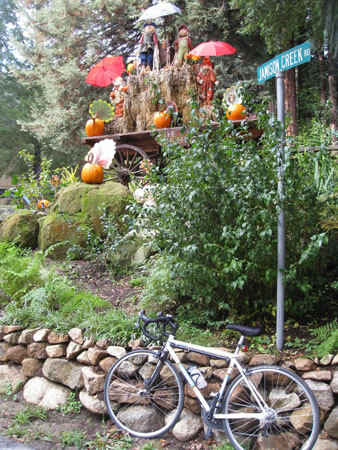 This Halloween display looks so quaint at the intersection of Jamison Creek Road and Hwy 236 a few miles north of Boulder Creek. The climb on Jamison to Empire Grade has stretches of 16 percent, although it is scenic. This entry was posted on November 27, 2011 at 2:10 pm and is filed under News. You can follow any responses to this entry through the RSS 2.0 feed. You can leave a response, or trackback from your own site.